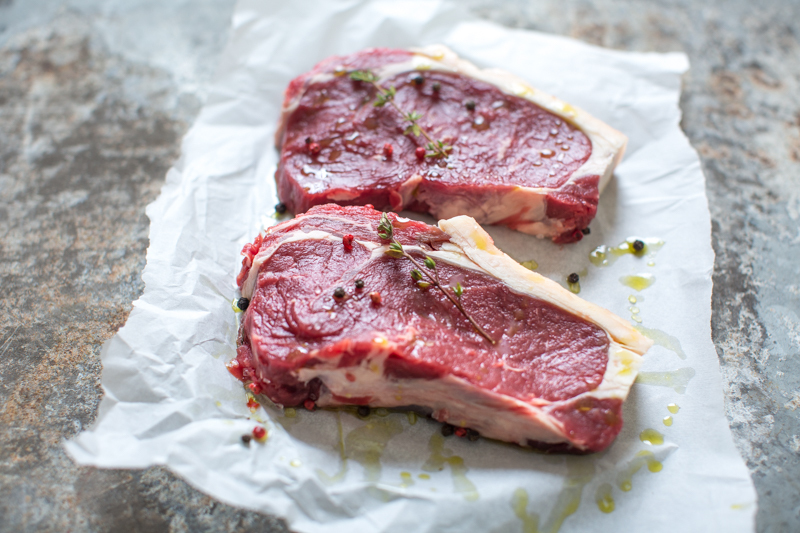 Top Question in our award winning butchers - Why does our beef tastes so damn good? Sorry, but is a long answer to a long process! Purchase the very best beef you can afford. We use a grade that sets us apart from the crowd. Create a dry aging room to age the beef on the bone for up to 40 days or beyond, no contact between the primal joints. It’s a carefully controlled symphony of chemical reactions and biological processes, performed day & night since I turned on the fridge in 2014 when we took delivery of our first prized Dorset reared steer. At this point we had no counters in the shop, but that delivery was destined to sell in 4 weeks so the time was ticking. The process from that day has been constant and the team at Brace of Butchers ensure the beef is matured in perfect conditions enhancing flavour and tenderness. All beef is aged a bit but there are two forms, wet aged i.e. matured in blood sealed in a bag or dry aged, where the beef is hung on the bone and loses a little weight while the chemistry happens inside. The ageing is not the most important bit as all beef is aged for some time. Supermarkets will advertise aging but this can be from as little as eight days. Meat that hasn’t been aged at least this long has a bland and metallic flavour. On delivery our beef is checked, graded and booked in. We have a strong focus on the provenance and history of our beef so the farmers call in with the information after delivery. They provide rearing history, breed and their thoughts on the confirmation and fat cover (fat thickness). We pay the farmers direct and they get paid more for higher quality beef so it’s in their interest they carefully select the right animal and the call into the shop after delivery allows them to check the weights and grading met their expectations. The journey starts here, it’s going to take 3-4 weeks minimum, and in that time there will be a constant control of temperature and humidity with good air circulation. The enzymes in the meat break down the protein, fats and glycogen. This process produces fatty and amino acids including glutamates. We have a sister company called The Wasabi Company and we often use the word Umani (one of the 5 basic tastes) as its found in Japanese soy and miso but also found in parmesan cheese. The glutamate is the natural version of MSG and provides an incredible flavour profile when the beef has been aged properly. As well as this amazing flavour enhancement there are friendly bacteria’s creating tenderness by breaking down the muscle fibres and connective tissues, changing fats and loosening the collagen. What do you get when its aged properly? As the beef is aging we are removing cuts that have completed aging process and this creates a part carcass called a Pistola (spanish for pistol as it looks a bit like one). The meat arrived at 75% water and by the end we are expecting to be 70%, or there about. It does not sound much but it is creating a concentration of flavour - like reducing a good sauce. The rest is all about carefully selecting cuts to meet our customers needs. Our expert butchers are able to assist with expert advice and even give you hands on lessons on how we create the cuts and Joints . Our goal is to ensure you have a better understanding of your local butcher and the science of Butchery at The Brace of Butchers, Poundbury.